The bus from Pucon to San Martin de los Andes took us across the Andes and back across the border into Argentina again. The drive was scenic, but a bit rainy. We also got to watch a weird film that I think was about people with magic powers trying to find the holy grail… Part of the immortal instruments series I think? But I had my headphones in and so was trying to follow the Spanish subtitles, which made it fun… I can read a fair bit now, just don’t ask me to how to say anything! 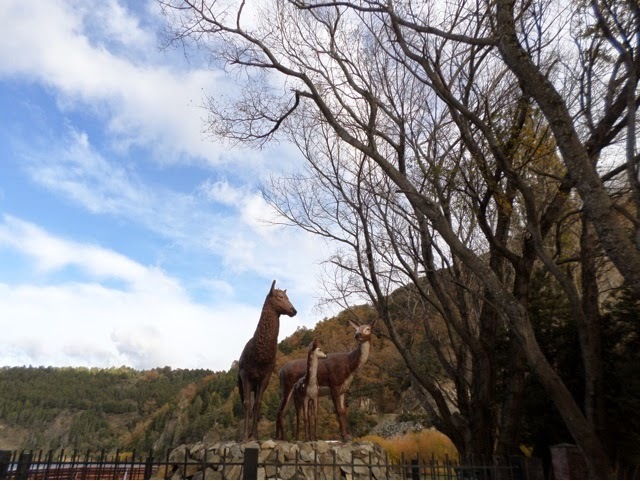 San Martin de los Andes is a small town on the edge of a lake called Lago Lacar and is pretty much encircled by a national park, Lanin National Park. The town is very cute and feels exactly like a European ski village. A lot of the houses are all wooden, they even have some little log cabins. I really liked it here, although we didn’t stay for very long. After being pretty exhausted from all the activities in Pucon it has been nice to just visit somewhere quaint and pretty and to just mooch about! We arrived to rain and slogged over to our hostel. After the mandatory orientation walk up and down only two streets, it really is that small here, we headed for an early dinner at the only place open…. The Dublin Irish Pub! A bit shocking to go somewhere like that over here when there’s such good local food on offer, but when it’s cold and wet and you’re hungry… Well a girls gotta eat! The next day was overcast and I had had a rubbish night’s sleep on the worst pillow ever! The day was spent wandering around the cute little shops in the town, although as its low season a lot of stuff wasn’t open. 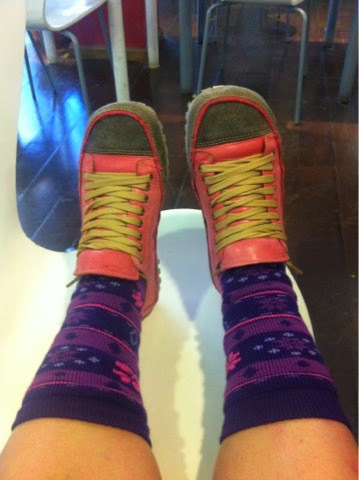 I also gave in and admitted that my Toms need to go in the bin and bought some cute new pink sneakers, I love them :-). Down by the lake there are lovely views out across the hills which are just glorious in all their autumn glory. There are a few small boats and some of the group took a boat trip out into the lake. You can also kayak there, which I was quite keen on, but the weather was just too bad. I ended up having a lovely lunch in a tiny cafe with the girls, we had empañadas and ricotta and cherry tomato pie, yummy cold weather food. View of the small harbour, it super cute. In the afternoon I headed for a massage to undo the damage of Pucon! I had thought that my legs were just stiff and that my shoulders were fine, oh how wrong I was! It was an hour and a half of pretty much nonstop pain, but the masseuse really knew what she was doing and went after all my knots. It was so painful when she was massaging my legs though as they have taken a serious beating recently and are extremely bruised. Afterwards my shoulders felt like they were sitting about five inches lower though so it was definitely worth it! My massage was followed by very necessary tea and cake! 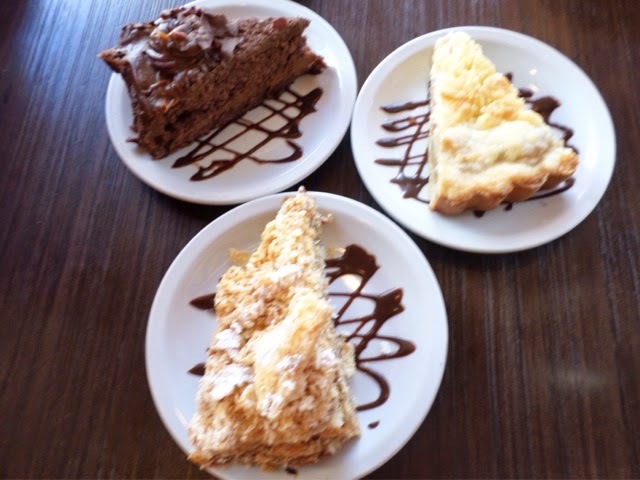 I had a wonderful cake made up of layered pastry and Dulche de Leche. Although it was so rich I had to have it to take away and it took me several goes to finish it! 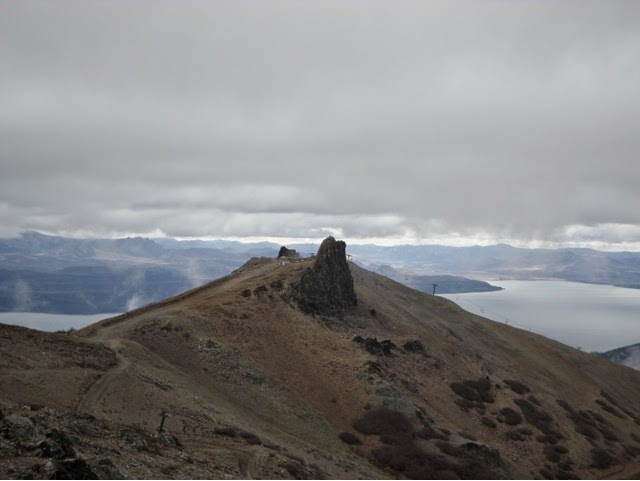 The following morning we jumped on a short (only four hours) bus to Bariloche. The bus was pretty crap though as the temperature constantly fluctuated between roasting and freezing! 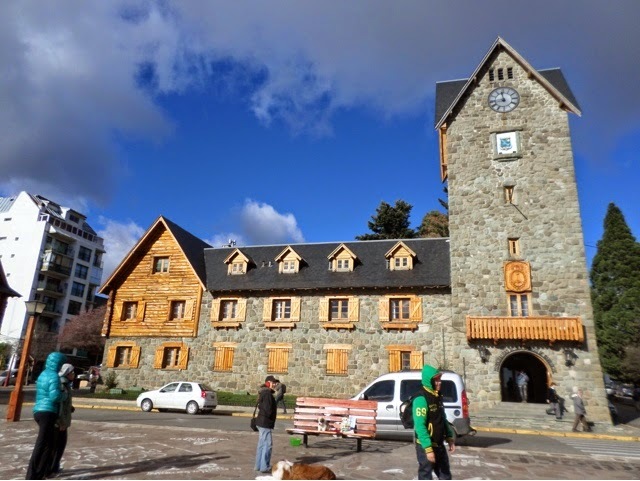 Bariloche is similar in feel to San Martin de los Andes, only far larger. 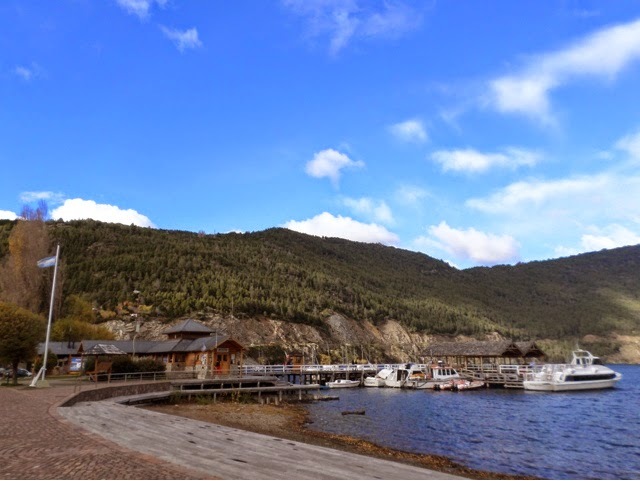 Again the town is positioned on a lake, Lago Nahuel Huapi. 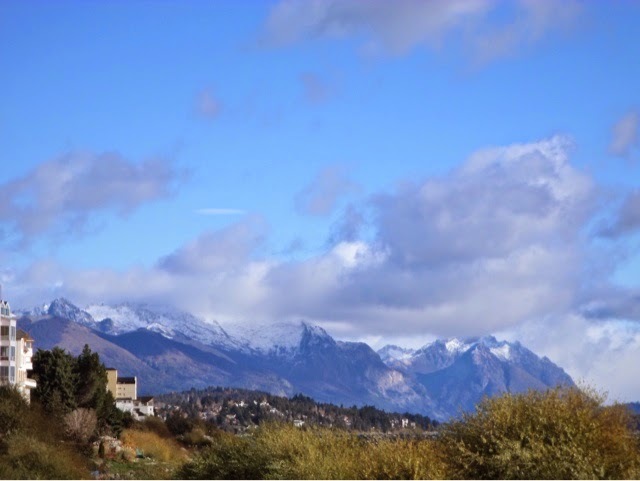 It is a skiing town and is surrounded by mountains, although at this time of year the snow is only just beginning to appear. In the afternoon a few of us took a tour of the area surrounding the town. The tour guide was so extremely informative I just couldn’t retain all the information, probably less than half of it! It was interesting, but I was extremely sleepy from two nights of appallingly bad sleep too. 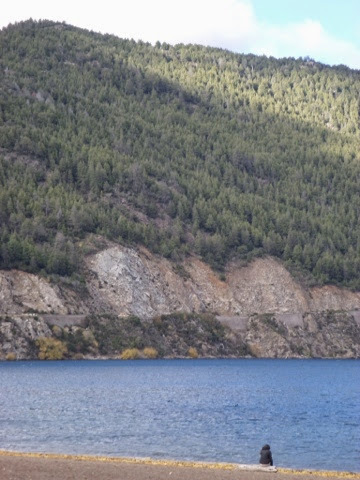 Apparently the town is named after a Mapuche community which is located South west of the main town and it means “the other side” as it is located on one side of the lake. 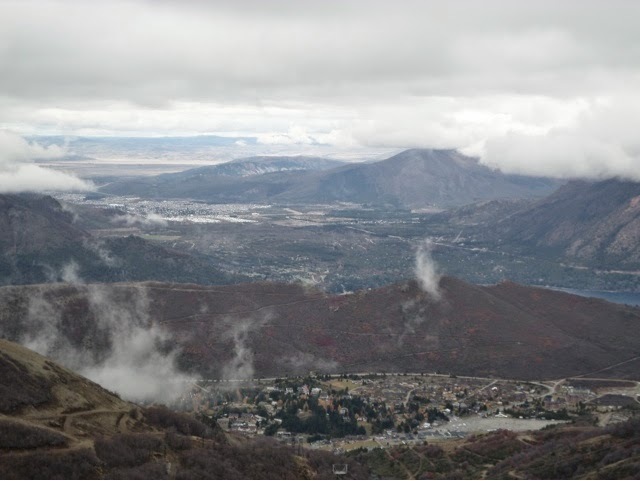 The modern town was settled by Europeans crossing the Andes, who reached the area by boat across the lakes. Originally it was settled as an agricultural area, mainly cattle for beef. A German man then set up a local shop importing goods from over the Andes and he would trade with the local residents, sending their products back over the mountains. Originally his business was simply called “The German” but eventually he renamed his business “St Charles” and when the area officially became a town of Argentina it was name St Charles de Bariloche after him. He then sold his business and opened a large hotel, Hotel Llau Llau, for which the area became famous, although the original building unfortunately burnt down. 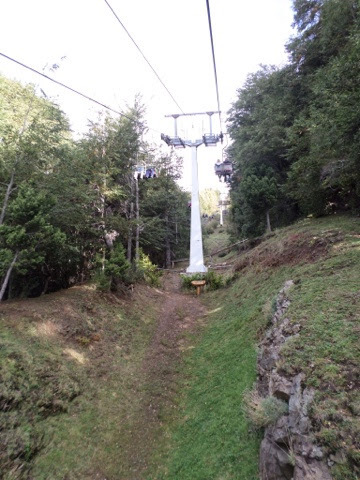 The first stop on our mini tour was at Cerro Companario, where we took a chairlift to the top. I had never been on one before, as I’ve never had the chance to go skiing or anything similar previously. It was quite exciting :-). 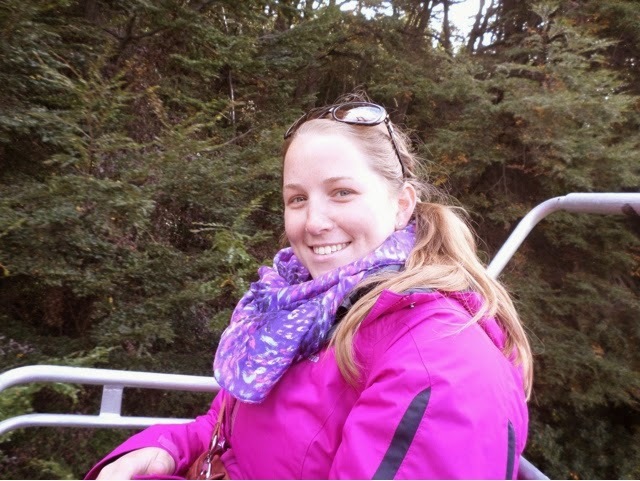 I’m on a ski lift… Not looking nervous in any way at all 🙂 bizarrely I found the idea of doing this more scary than anything else we have done so far and I have been rafting, riding and hiked up a volcano in the last two weeks! I just love the colours of the trees, autumn had always been my favourite time of year and it is one of the things I miss most about the UK. It’s just like home! From the viewpoint at the top you could see almost 360 degrees across the three lakes of the area, it was lovely. At first we were all a bit worried as thick mist instantly descended around us, but it quickly passed by and the amazing views appeared around us, quite dramatic really. View from the top, looking across Lago Perrito Moreno towards Cerro Lopez. 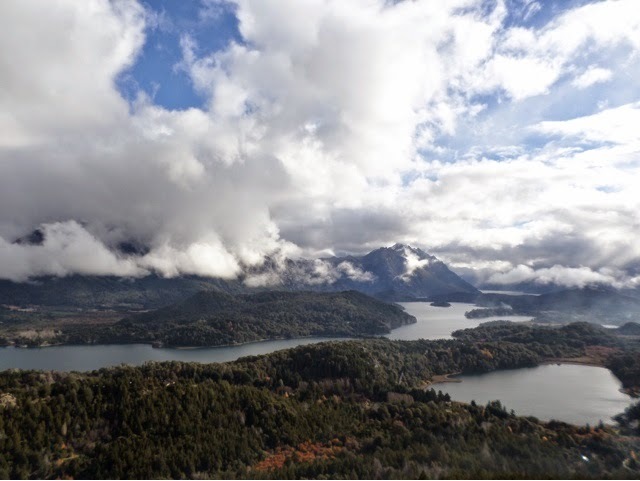 Views across Brazo Campanario in the foreground and Lago Nahuel Huapi behind. We drove over to the Hotel, as it is such a famous landmark. It’s quite impressive. It was actually the first hotel built in the town and pretty much revolutionised the industry of the area from farming to tourism. 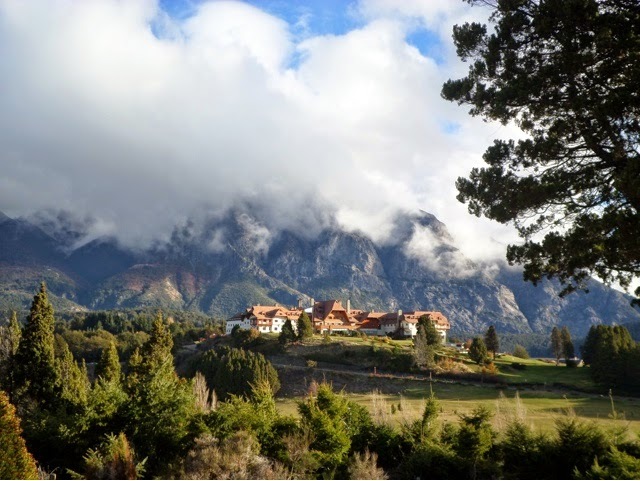 It originally served as a stopping off and recovery place for people arriving across the lake and it was originally called ‘the dirty spoon’, its current name Llao Llao translates to mean ‘sweet sweet’ and sounds a lot… Sweeter. We also stopped off at a small chapel, which is built out Patagonian Cypress, the only native type of pine tree found in this part of Patagonia. 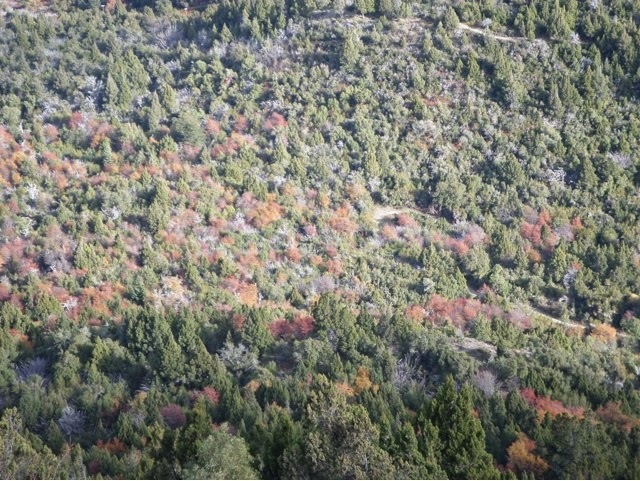 Although there are now many types of pine tree around, these are all imported species. The chapel was built after a donation from a wealthy woman from Buenos Aires and it is named for her son who died the day she bequeathed the funds, Chapel Saint Eduardo. It’s quite pretty, but we arrived at the same time as a huge tour group so it was swarming with people. It had nice views across to the hotel though. It was quite funny seeing all the people queuing up and paying large amounts of money to have their photos taken with a Saint Bernard dog though! From there we headed through the Parque National Llao Llao to Bahía López, which again has nice views across the lake. It was extremely cold though and we were all feeling pretty tired so after a quick wander along the beach and few photos we jumped back in the warmth of the van. 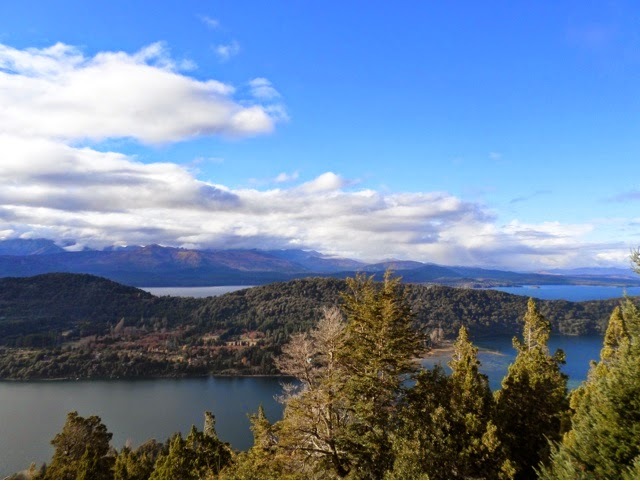 Our final stop was at a viewpoint looking out to Cerro Llau Llau and Isla de los Conjeros on the Lago Perito Moreno. 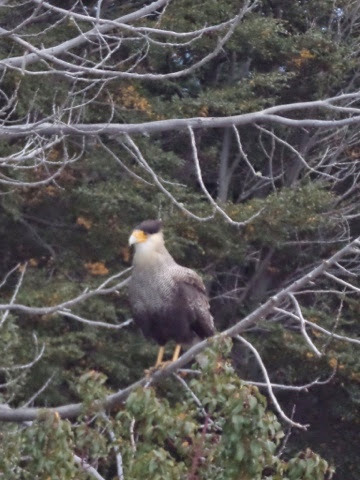 There were some birds around, which were swooping extremely close. They have obviously gotten see to tourists feeding them as they will come within a metre or two. 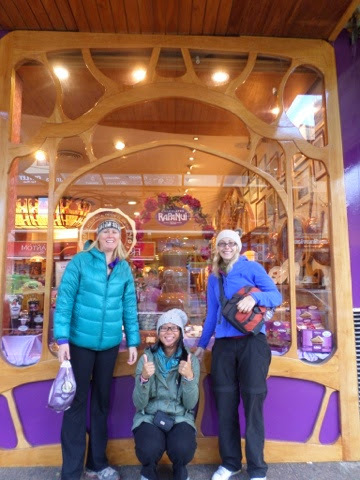 Apparently they like churros…. 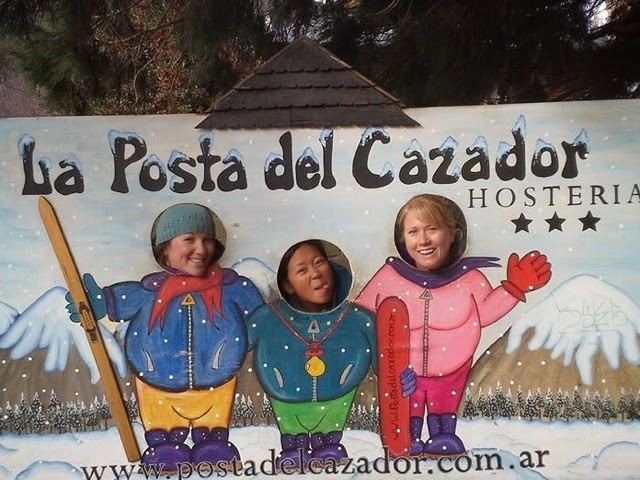 That night we looked into booking an excursion to the black glacier nearby. It looks black due to the amount of sediment trapped in the ice. Unfortunately, due to it being off season, the trips are hugely overpriced and you spend most of the day just sat on a bus. As we’ve got a 24 hour bus ride looming I really didn’t fancy doing this, although it was a real shame not to see the glacier. We headed for dinner and ended up having an enormous and amazing feast. 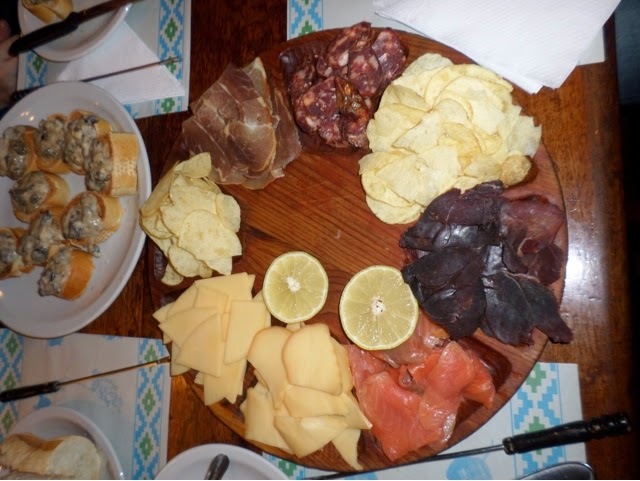 We shared a platter of Andean smoked meats, salmon and cheeses, with pâtés and bruschetta with creamy mushrooms. This was followed by two types of cheese fondue, classic swiss and Camembert. Combined with a nice bottle of Malbec it was just amazing, although I was fit to burst by the end of it, my god I am getting so fat on the trip! We also stopped for ice cream on the way home, I’m not sure we could have eaten any more animal derbies products in a single meal if we had tried! 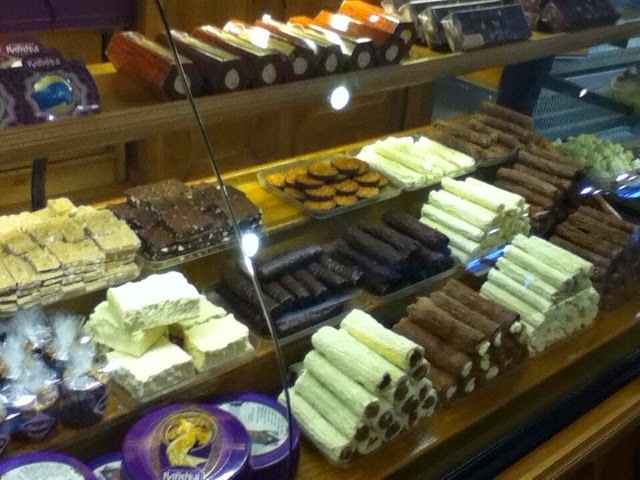 The next day I had a wander around town and bought some lovely chocolate. They sell chocolate coated raspberries that have been coated firstly in white chocolate and them in milk chocolate. They are amazing!!! I also bought the biggest chocolate flake you can possibly imagine! Yum yum yum yum yum yum…. 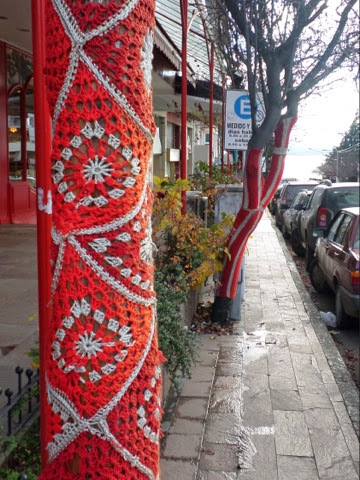 I love how a lot of the trees here have been yarn bombed and it makes the town look really nice and colourful, although the shops are all fairly colourful on their own. I then caught a local bus out to Cerro Cathedral, which is the highest peak in the area. 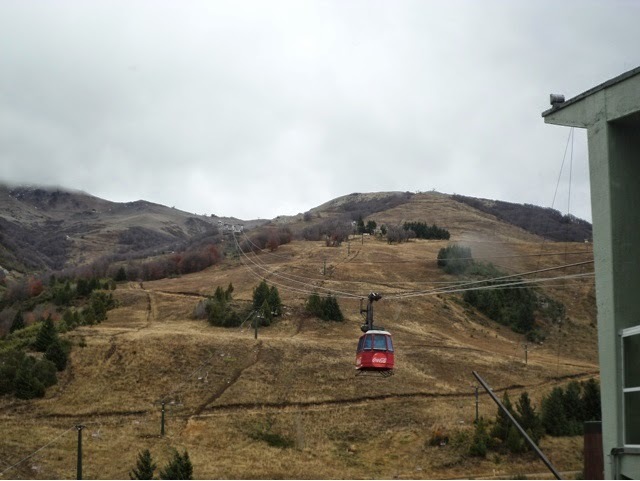 From the town at the base of the mountain you catch a cable car and then a chair lift up to the top, where we stopped for lunch. 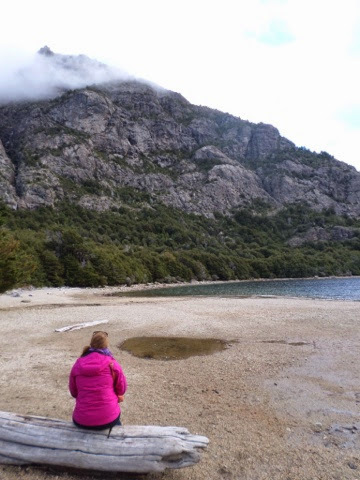 The views are across the whole area, across both Lago Nahuel Huapi and Lago Gutiérrez, it was pretty spectacular, but very cold and windy and pretty misty too. They suffer from really strong westerly winds across the lake here, they can reach over 100 miles per hour and have actually caused most of the branches on the trees and bushes to all point to the east! 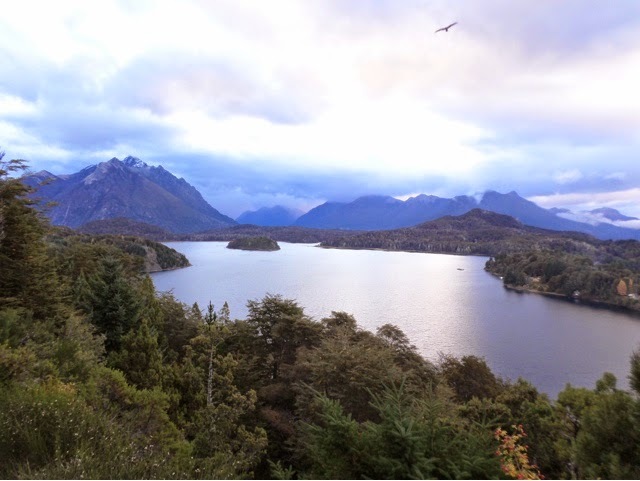 View across to Lago Nahuel Huapi. 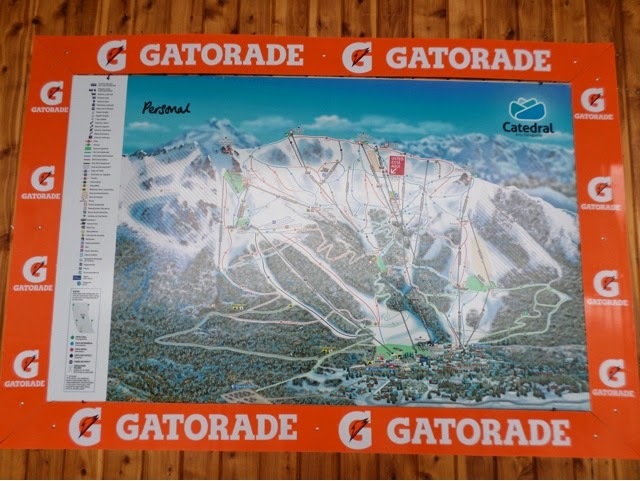 You can see Cathedral village at the base and across to Bariloche town in the distance. 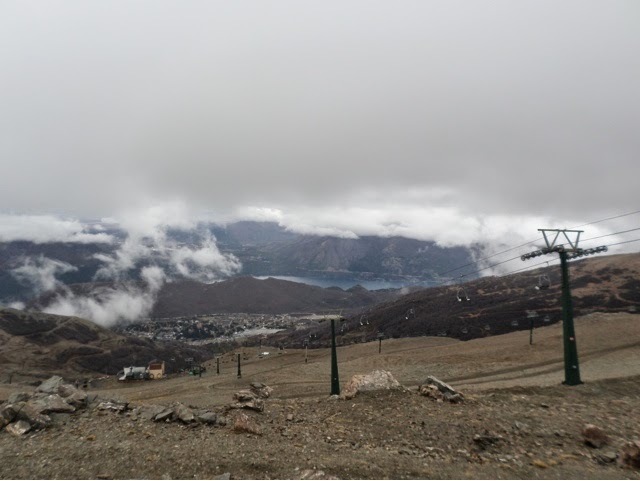 View across the empty ski field to Lago Gutierrez. 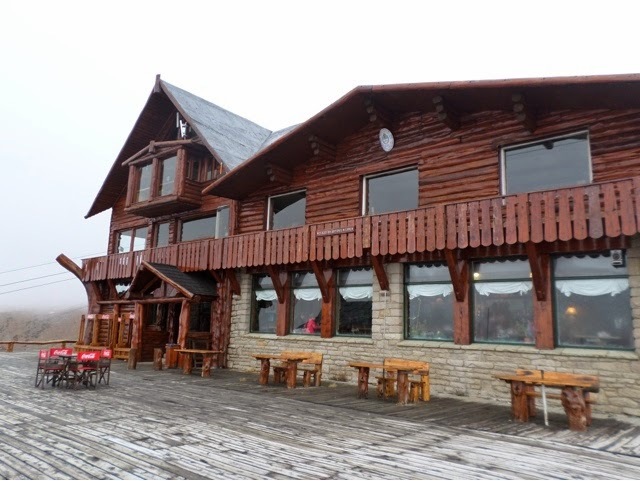 We had lunch in one of the skiing restaurants that was open on the mountain, although we sat inside! 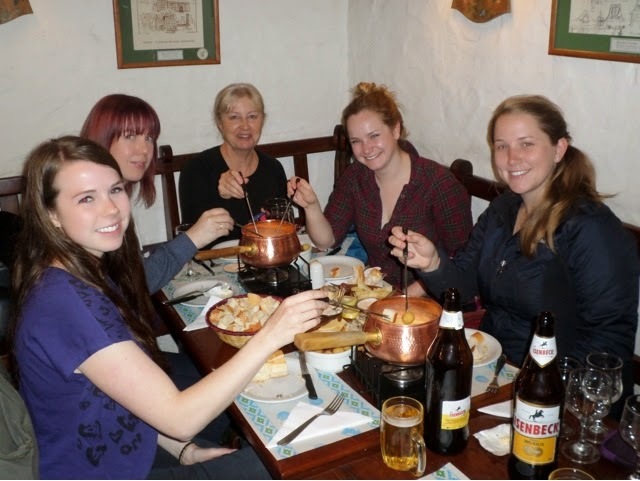 That night we all had a nice group meal together and I had Goulash. Some people had the most enormous steaks I have ever seen in my entire life! The last morning was spent wandering around the lake, admiring the snow that fell on the mountains overnight. It was extremely cold and windy and we retreated to buy supplies for our bus journey. 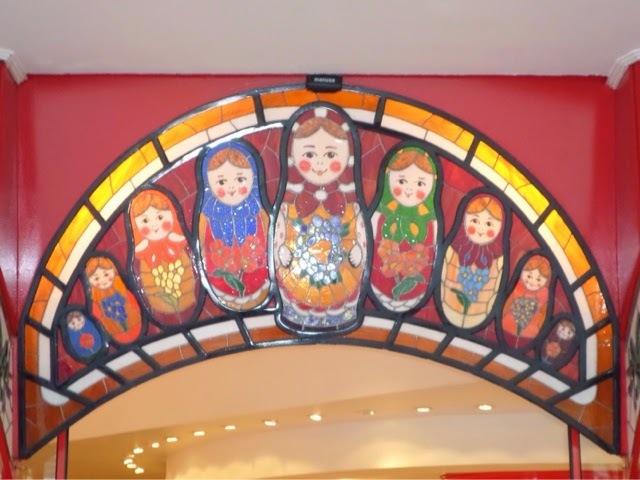 Lovely stained glass outside Mamuskas. 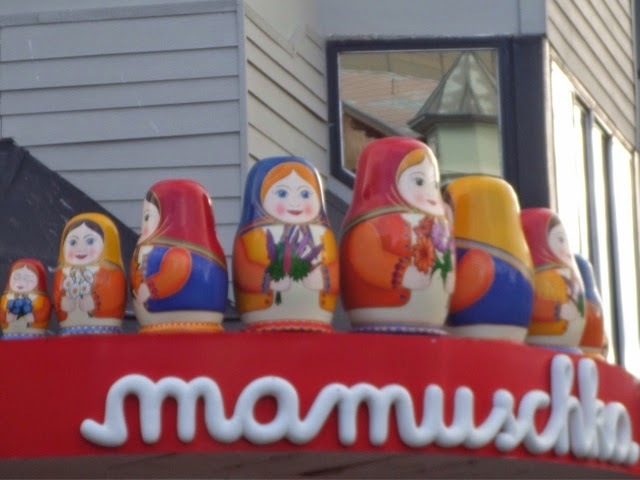 The dolls above the door rotate. 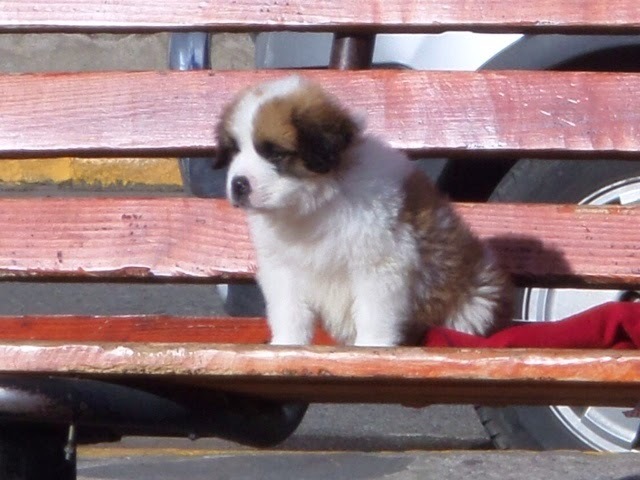 We stopped in the main square along the way and saw more dogs to have your photo taken with along with this super cute puppy! I also spotted more yearned bombed trees 🙂 love it! We then headed off to the east coast, a 24 hour bus ride to Buenos Aires, on which I am writing this post. Bring it on! 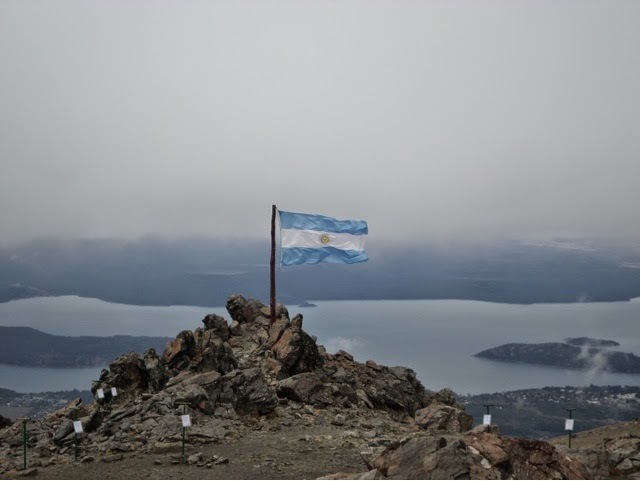 This entry was posted in Travel and tagged Alps, Andes, Argentina, Bahia Lopez, Bariloche, Brazo Companario, Cerro Companario, Cerro Lopez, Chocolate, Dulche de Leche, Fondue, Hotel Llao Llao, Intrepid, Isla de los Conjeros, Lago Nahuel Huapi, Lago Perriot Moreno, Lanin National Park, Mapuche, San Martin de los Andes, Shoes, South America, SouthAmericanAdventure, Travel. Bookmark the permalink.